The current ‘contemporary’/’traditional’ worship music controversy, although cloaked in the guise of novelty, illustrates how the historical interplay between embracing and abandoning black-and-white oppositions is unfolding within post-millennial Western Christianity. Over the past forty years, mainline Protestant churches have used worship music to negotiate a culturally-relevant space for themselves within the contemporary reconfiguration of American religious practice. As such, many North American and Western European Christians have come to conceptualize their current religious practices through the ‘traditional’/’contemporary’ dichotomy. Praise-band-led ‘contemporary’ worship contrasts with organ-and-choir-based ‘traditional’ worship in visible and audible ways: musical style, text, instrumentation, dress, and physical space. This ‘contemporary’/’traditional’ binary’s pervasive themes resonate with previous dichotomous models applied to religious study, such as Weber’s routinized/charismatic, Benedict’s Apollonian/Dionysian, Sachs’ logogenic/pathogenic, and sociologist Mark Chaves’ intellectual/emotional. Yet, while current mainline Protestant organizational and expressive behavior resonates with these historical dichotomies, it also moves beyond explanation by any of these theories alone (as well as moving beyond the fundamentally group-defining “us” versus “them” opposition). This paper suggests the public/private opposition as an analytical tool to cut in a slightly different direction against the grain of the oft-dichotomized sphere of mainline Protestant religious musical practice. While no single dichotomy can explain current mainline Protestant practice – subjectively, emergently employing overlapping dichotomies to create and negotiate meaning – the public/private binary probes fundamental points of differentiation. Public, private. Sacred, secular. Contemporary, traditional. Dichotomies such as these attempt to make the world into an orderly, organized place. Many people find comfort in these highly structured systems. Yet, stable and soothing as they may be, dichotomies can over-simplify complex dynamics that are not in fact so easily untangled. Human relations and society often defy the clear boundaries constructed by a black-and-white opposition. Nevertheless, even though dichotomous models might not form the best conclusions, they remain powerful cultural constructs and analytical tools. Many North American and Western European Christians conceptualize their current religious practices through the ‘traditional’/’contemporary’i dichotomy. This binary’s pervasive themes resonate with previous dichotomous models applied to religious study. Yet, while current mainlineii Protestant organizational behavior resonates with these historical dichotomies, it also moves beyond them (as well as moving beyond the fundamentally group-defining “us” versus “them” opposition). This paradigm shift of institutionalized religion calls for a parallel response in analysis. I suggest the public/private opposition as an analytical tool to cut a different direction against the grain of the oft-dichotomized sphere of mainline Protestant religious practice in a new direction. Applied to ‘traditional’ and ‘contemporary’ mainline Protestant worship music style, the public/private dichotomy illuminates two main points. First, controversy over mainline Protestant worship music evidences and enacts a broad cultural paradigm shift in American religious practice. Second, the public/private dichotomy demonstrates that although paradigms are shifting, people still desire structure and stability. To achieve this goal, they employ individualized, emergent categorical definitions to experience order and authenticity. As a theoretical model with fixed definitions, the public/private opposition does not directly correlate to the ‘contemporary’/ ‘traditional’ worship music opposition. However, in everyday religious life, worshippers selectively redefine public and private to create individual systems of meaning to validate particular worship music styles. The following paper uses three sections to explore the role of music in mainline religious reconfiguration. Initially, I present the conflict as a culturally contextualized dichotomous construct. Then, I briefly overview parallel dichotomies frequently applied to religious music. Finally, through analysis of Hillsboro Presbyterian Church’s Sunday morning services, I demonstrate that emergent individually-defined, historically- and culturally-situated definitions of public and private fundamentally differentiate ‘traditional’ and ‘contemporary’ worship styles. The music at the [‘contemporary’] morning service reaches all genres… that truly speaks to how this church, its members, and Christianity in general transcend all of those artificial barriers that we erect and have been compiling for years. As their name implies, mainline denominations describe themselves as theologically and socially moderate. Similar to American culture at large, these organizations have a rhetoric lauding diversity, tolerance, and openness.iii These groups are proud of their centuries-old histories, while also valuing institutional change in response to changing historical and cultural circumstances. Mainline denominations do have firm core beliefs, but they – like their contextualizing cultures – have largely gravitated away from fixed definitions and moved towards relativistic positions that accept some questions as unanswerable. Nonetheless, during the 1990s many of these mainline moderates took extreme positions in a fierce debate over religious music. Ultimately, two main camps emerged in these so-called “worship wars”: proponents of guitar-band-led ‘contemporary’ worship versus supporters of choir-and-organ-based ‘traditional’ worship. The pervasive rhetoric of this dichotomizing debate exerted such force that most mainline churchesiv came to label their worship based upon its musical genre: either ‘traditional,’ ‘contemporary,’ or a ‘blended’ mixture of both styles. Describing worship music without employing this new opposition of ‘traditional’ versus ‘contemporary’ now failed to relevantly position the music within its cultural context. Since the turn of the millennium, the worship wars have reduced their intensity from a rolling boil to a sustained simmer, but the disagreements fueling their flames have not been reconciled. The ‘contemporary’/’traditional’ paradigm continues to dominate mainline American and Western European Christian worship. Tired of arguing and unable to declare a clear winner, the two sides have conceded that the two styles are both indispensable and incompatible. To be sure, everyone has musical preferences, but individual playlists are growing more and more eclectic. As evidenced by MP3 players that now come pre-loaded with samples in genres ranging from salsa to singer-songwriter, most people, including the mainline Christians under discussion here, enjoy multiple styles of music. Lyrical content aside, no mainline denomination claims that any particular musical genre is more intrinsically sacred than another. Additionally, the denominations with the most musical tension are not conservative groups, but rather the churches with relatively diverse (even pluralistic) theology. Given both the general cultural trend towards musical eclecticism and the parallel mainline movement towards ideological and theological diversity, how has an oppositional dichotomy come to structure the intense controversy over mainline religious musical style? [Traditional church music is] in rigid meter, it’s locked in. I mean, is your relationship with God locked in, or are we just making it up as we go? The controversy does not stem entirely from the musical content, but also from the accompanying social and cultural changes that the music affects. The music itself indeed constitutes a point of contention. ‘contemporary’ and ‘traditional’ worship musics manifest many visible and audible differences: musical genre, text, instrumentation, dress, and physical space. These immediate contrasts alone – for example, should a congregation sing from sheet music in hymn books or from lyrics projected onto a screen? – often trigger substantive conflict. On one level, churches see the arguments as being about finding the best mode of musical transmission, i.e. do people worship better by singing from hymnals or projected lyrics? But, answering such questions moves beyond mere vocal production to require consideration of the broader cultural experience. “Better” implies a sense of context, that is, of musical genre and particular musical literacy of stylistic rules, i.e. the projected lyrics are not simply pages from the hymnal but rather departures to a different musical and theological genre. Does “better” assign greater inherent value to one particular genre of music? Is this aesthetic or spiritual value? Who defines what it means to sing “better?” The argument that began over how to sing quickly escalates to deciding what to sing. The problem of a religious group finding worship music that appropriately expresses its cultural and theological beliefs as old as religious groups themselves. As a socially constituted, publicly displayed, abstract art form (Schutz 1964:159) music provides a particularly effective vehicle for religious communication. For humans, music bridges the public and private spheres. In worship, music bridges the human and divine spheres as well. A religious group chooses worship practices so as not to err theologically, affront the divine, or subvert their understanding of appropriate human agency (Keane 2007:2). Musical practices illustrate ideal power relations. In the human-divine interaction, who initiates? Who acts upon the other? Which people should be making sacred music, and to what end? Does the community value sacred music-making as public and participatory or private and professionalized? On this level, what began as a discussion about what to sing for services becomes detailed analysis of the musical system’s values, which must be reconciled with the religious group’s cosmological world view. We return to our simmering mainline Protestants. Given that analyzing religious music can easily turn into a reconsideration of an entire socio-religious system, the worship wars of the 1990s seem like a logical outcome. But what prompted such musical introspection at the close of the millennium? Given the mainline Christian move away from centuries of theologically and socially dichotomous thought, how did these groups come to embrace the ‘contemporary’/’traditional’ opposition? People have certain pieces of music that are very emotionally satisfying for them from their background. And if you allow them that, on any kind of a regular basis, they won’t insist on it being the only kind of music, but if you don’t allow them that on a regular basis, they will complain endlessly. The worship wars, like most other wars, began when some people began to feel threatened. Folklorists and ethnomusicologists usually talk about marginally-surviving musics and cultures in relation to indigenous lifeways or colonization. Concerns of marginalization and vanishing music cultures often use the terms “hegemonic,” “dominant culture,” and “White Anglo-Saxon Protestant (WASP).” However, the American religious reconfiguration inverts the usual power dynamics of this structure. In this case, it is the historically-hegemonic middle-class, White mainline Protestants who feel that their sacred music and worship traditions from which they draw comfort are being replaced. The 2009 American Religious Identification Survey (ARIS) reports that Mainline Protestant denominations – American Baptists, Disciples of Christ, Congregationalists /United Church of Christ, Episcopalians, Lutherans, Methodists, and Presbyterians – lost 5.8% of their members between 1990 and 2008. This reflects the largest percentage loss of any religious group in the ARIS survey. ARIS survey co-author Barry Kosmin describes a substantive shift away from traditional religious practices and institutions, “More than ever before, people are just making up their own stories of who they are. They say, ‘I’m everything. I’m nothing. I believe in myself’” (Grossman 2009). Previously, mainline churches could rely to a great extent upon people’s sense of civic duty, religious identity, social pressures, and geographic proximity to fill their pews (Wind and Lewis 1994). However, current American religious landscapev increasingly finds organized religious practice as an affinity-based, optional activity. Churches, like other houses of worship, are becoming more consumer-driven, as they vie for the highly-mobile public who can be selective as they “church shop” for the congregation that offers their ideal blend of worship and social elements. For Mainline Protestant denominations, consistently declining membership has prompted a reconsideration of balancing public appeal and private identity. Evangelical and non-denominational churches that have been quicker than mainline denominations to incorporate popular musics have experienced less membership loss, and even growth. Mainline denominations have decided that, although they would “like a better fix on why so few new people are joining…doing something is better than passively observing” (Marcum 2008). Thus, for many struggling mainline churches, appealing to the public means turning away from pipe organs, choirs, and hymnody and towards guitar-driven praise bands and choruses. In growing numbers of congregations, organ-based worship has gone from being the style of service to being one of the styles. Within religious practice, music and other elements of worship style often publically proclaim the distinction between “us” and “them.” Recent sociological work supports the claim that “If ideas and expectations about God vary across social contexts, and if these ideas and expectations themselves influence worship practices, then specific practices will reside in particular social locations” (Chaves: 2004:140). Indeed, historically, one congregation has equaled one “particular social location” with one set of “specific practices.” Congregations tend to fall within just one spot on the continuum of expressive behaviors between traditional dichotomies of religious study. Having a single church with multiple worship styles would then bring both opposing ends of a binary under a single roof. The Hillsboro member quoted above illustrates the overlapping polyvocality of oppositions that worshippers use to mediate sacred ritual and music. She compares open and closed spaces, far and close proximity to musicians, styles of seating, multi-purpose versus dedicated venues, and more. Although she can “manage OK either place,” she has constructed the two places as substantially different through a series of oppositions. Identifying with both “us” and “them”, she eventually, but tenuously, pronounces both contemporary and traditional worship as problematic but nonetheless viable forms. This congregant (like her denomination as a whole), despite increasing ecumenicalism, mainline relativism, and cultural pluralism, demonstrates a continued proclivity towards analysis via dichotomies. Her accommodation of internal diversity and ambiguity is representative of mainline denominations as a whole. Since congregants employ multiple dichotomies in their interpretation of worship styles, scholars should afford their analysis similar multivocality. Controversy over religious music is nothing new, and a variety of dichotomous models have historically been applied its study. As Levi Strauss and his fellow paradigmatic structuralists have noted, surface-level oppositional dyads can be seen as manifestations of base-level values. What do the oppositions of the ‘contemporary’/’traditional’ dichotomy tell us? Do congregants employ (consciously or not) certain analytical models over others while parsing these musics? Do particular theoretical models refract the “guitars versus organs” debate to shed light on deeper ethnomusicological social analysis? The following section uses representative quotes from Hillsboro members to position the ‘contemporary’/‘traditional’ dichotomy within a brief historical overview of some of the binaries more frequently employed by Hillsboro members and other mainline Christians, ethnomusicologists, anthropologists, and social scientists in the study of religious music: Max Weber’s (1993:chap. 14) charismatic and routinized religion, Ruth Benedict’s (1934) Dionysian and Apollonian, Curt Sachs’ logogenic and pathogenic (1937:181-203; 1943:30-43), and Mark Chaves’ (2004:144) intellectual and emotional. What can these existing academic models of religious expression as dichotomous tell us about the current dynamics of the musical worship wars? One of the main issues at the heart of the ‘contemporary’/‘traditional’ debate regards structures of agency and authority. Weber’s routinized/charismatic dichotomy sheds helpful light on some angles of this aspect of the ‘contemporary’/‘traditional’ situation. Weber’s model of religious dynamics speaks to the locus of energy motivating a group. Writing during the first quarter of the 20th century, he pragmatically explored power structures and motivations of communal religious behavior in Europe and abroad. According to Weber, charismatic religions begin through the powerful personal force of one individual. As the religious movement grows, however, it tends to develop routines and employ institutional structures to maintain order. In lieu of a charismatic leader, these constructs create collective solidarity and discipline a congregation into conformity. The Presbyterian Church directly reflects Weber’s model of routinized/charismatic religious behavior. Originally formed in the 16th century under the dynamic leadership of John Knox, a student of the charismatic reformer John Calvin, Presbyterianism quickly embraced a regularized routine and denominational identity based on its core values of worship as “decent and in order.” With centralized authority, codified rules, centuries of history, rituals, and traditions, the Presbyterian Church and other mainline denominations embody Weber’s ideal of routinized religion. The routinization of mainline Protestantism has provided a point of contrast between these organizations and competing religious groups. Mainline Protestants have historically granted formal education, intellectualism, and academic credentials great authority. Worship music according to the Presbyterian Book of Order, functions subordinately to support an exegetical sermon delivered by highly educated clergy. While mainline Protestants would not describe themselves verbatim using Weber’s terminology, they are frequently derided by more charismatic groups as fitting the dictionary definition of routinized: having been “reduce[d] to a routine” (“Routinize” 2010). The hegemony and routinization of mainline denominations has frequently been challenged by charismatic leaders of new religious configurations, from frontier camp meetings to the Azuza Street revivals. Weber’s dichotomy illustrates this historical theme’s recurrence in the ‘contemporary’/‘traditional’ worship wars on two levels. First, the routinized/charismatic opposition speaks to the current institutional reconfiguration of American religion. Evangelical emphasis on charismatic leadership, experience, and emotion – frequently found through musical production – challenging the routinized mainline Protestant system of meaning is nothing new. However, analysis of the ‘contemporary’/‘traditional’ music debate demonstrates that congregations are parsing the underlying routinized/charismatic dynamics through institutional changes that represent a liminal point in the restructuring of American Christianity. Previously, charismatic leaders built new religious communities by seeking out similarly-minded folk to form their own larger organizational bodies which would then increase, multiply, and expand into denominations. However, the current American religious landscape has seen a marked decrease in such denominationalism and a parallel increase in non-denominational and independent churches. These independent churches frequently employ popular music and draw upon unique local characteristics, such as personal charisma, and perceived everyday connection of the ministerial and musical staff to the divine. As such, ‘contemporary’ music has come to symbolize these iconoclastic values and an institutional break from ossified religious groups that have been reduced to routine. ‘Contemporary’ music as representative if a new institutional form dovetails into the second main application of Weber’s routinized/charismatic dyad to the ‘contemporary’/‘traditional’ tensions. The popularity of these independent and Evangelical houses of worship challenges the continued cultural relevance of the mainline Protestant denominational system and its forms of worship. No longer able to rely heavily upon collective institutional allegiance, many mainline churches have sought to infuse their routine with elements of their competitors’ charisma. Most frequently, this has meant the adoption and adaptation of Evangelical ‘contemporary’ music by ‘traditional’ mainline congregations. They struggle to maintain the identifying features of their routinized systems while incorporating elements – most frequently musical – from the very charismatic movements that have arisen in contrast to them. Applying Weber’s routinized/charismatic dyad sheds illuminating light on aspects of the ‘contemporary’/‘traditional’ dichotomy. On one hand, it reminds us that the tensions between routine and charisma, consistently re-emerge in the guise of novelty. On the hand, however, applying the routinized/charismatic dyad to the ‘contemporary’/’traditional’ dynamics highlights some novel institutional dynamics and configurations in response to this continual tension. To address issues of restraint and release, anthropologists have long explored a comparison similar to the charismatic/routinized opposition through the Apollonian/Dionysian dichotomy. This model references two contrasting gods of the ancient Greek pantheon to idealize and explain social and religious behavior: Apollo, the god of the sun, light, noble ideas, music, and poetry; and Dionysius, the god of wine, drunken excess, and ecstasy. While the ancient Greeks recognized the ideal qualities as different, they did not cast Apollo and Dionysius in direct opposition to each other. Rather, it was later Western philosophers, who fit these gods into a dichotomous analytical model. Nietzsche’s influential 1872 Birth of Tragedy widely popularized the opposition by critiquing drama within the Apollonian and Dionysian framework. Although Nietzsche later rejected his conclusions based upon this stark opposition, the dichotomous tool made its way into linguistics and anthropology, and indirectly into the rhetoric of the worship wars. Most notably, anthropologist Ruth Benedict structured her influential 1934 book, Patterns of Culture through the Apollonian-Dionysian dichotomy. In this work, Benedict analyzes three “primitive” culture groups, the Zuni, Dobu, and Kwakiutl within the Apollonian-Dionysian frame. She essentializes these cultures as primarily Apollonian or Dionysian based upon their predominant values. Benedict stops short, however, of claiming this dichotomous conclusion as universally applicable. She finds that “Western civilizations, with their historical diversity, their stratification into occupations and classes, their incomparable richness in detail, are not yet well enough understood to be summarized under a couple of catchwords” (Benedict 1934:54). Disregarding Benedict’s disclaimer of complexity, during the height of the worship wars, similar cultural and theological judgment based upon musical practice was running rampant within many Western Christian circles. These two poles – perfect refinement versus excessive release – have be easily grafted onto the opposing extremes – the “frozen chosen” versus “hands-in-the-air praising” – of the contemporary Christian worship wars. Post-millennial mainline Protestantism clearly displays the dynamics of the Apollonian/Dionysian dichotomy. Benedict’s desire to summarize culture within a few words can be seen as representative of modernist aspirations for clear-cut distinctions and fixed definitions that continue through the present day. While the terms themselves, Apollonian and Dionysian, are not frequently used, their value clusters are. At the farthest extremes, mainline Protestant detractors decry encroaching ‘contemporary’ music and emotive worship an unnecessarily excessive, indulgent, and unbiblical foil to refined, respectful, and noble worship. Just as social science documents the prevalence of culturally mediated Dionysian release within festivals, protesting mainliners frequently acknowledge ‘contemporary’ music more appropriate for worship on occasion or outside of Sunday morning ritual. The Apollonian/Dionysian dichotomy helps us to probe tensions of restraint and release both pent-up and let loose within the reconfiguration of American Christianity. Just as Weber’s routinized/charismatic model illuminates only certain angles of the situation, the Apollonian/Dionysian model alone does not provide a satisfactory conclusion. However, engaging both of these theories helps us better understand elements of the theoretical polyvocality that worshippers are applying to the experience. The relationship between music, text, and behavior remains central within everyday experience as well as academic analysis. Much of the ink spilt during the worship wars has addressed the music text relationship in two ways: 1) the relevance of music, text, or the combination thereof to everyday life; and 2) the empirical value of music, text, or the combination thereof. The logogenic/pathogenic dichotomy operates along similar lines to the previously discussed oppositions, yet brings a slightly different focus. Writing just slightly after Ruth Benedict, comparative musicologist Curt Sachs described the relationship between musical types, texts, and accompanying cultural phenomenon. He originally divided music into three types – logogenic (word-born), pathogenic (motion-born), and melogenic (music-born) – but the logogenic-pathogenic opposition has been more widely circulated. Sachs correlated musical movement with dance and expressive behavior. According to his model, logogenic music moves in smaller intervals and accompanying actions tend to be more refined. Pathogenic music and movements, in contrast, feature larger jumps within broader ranges. Similar to Benedict’s terms of Dionysian and Apollonian, Sachs’ terms of logogenic and pathogenic have not moved to the forefront of common usage or the rhetoric of the worship wars. Indeed, Sachs’ logogenic-pathogenic dichotomy has been strongly criticized by ethnomusicologist Bruno Nettl as too broadly applied and Alan Merriam bluntly dubbed them “simply not acceptable” (254). Nevertheless, Sachs’ underlying premise that there are “broad correspondences of music type and cultural considerations” (Ibid.) holds continued relevance. The relationship between musical elements and other aspects of culture lies at the heart of the controversy over mainline musical style: that changing musical selections would also impact theology and group identity. Sachs’ theories were not developed to address musical change, but his conclusions have been widely applied in the rhetoric of the worship wars. Without directly referencing Sachs, proponents of ‘contemporary’ or ‘traditional’ music frequently assume Sachs conclusions of a causative link between musical style and cultural behavior. Thus, mainliners often extrapolate, assuming that adopting ‘contemporary’ music would not be possible without adopting fundamental cultural changes. To illustrate and only slightly exaggerate, some conservative mainline ‘traditionalists’ fear ‘contemporary’ music as a slippery slope with textually and musically repetitive praise choruses leading to clapping and other movement during worship, leading to evangelicalism, leading to entertainment replacing worship. Many of these ‘traditionalists’ value the quiet reserve, lack of improvisation, and predictability of ‘traditional’ music as reflective of a solidity and grandeur emanating from the divine and reflected through the Church. However, many ‘contemporary’ proponents do not experience the music in this way, nor do they find such an effect theologically sound or culturally relevant. Conversely, some advocates of ‘contemporary’ music see their musical forms as physically invigorating worship, which in turn enlivens faith, which leads to a more deeply embodied everyday experience of God. Without specifically referencing Sachs’ model, both sides of the worship wars focus on the power of the ‘contemporary’ music and texts to motivate movement. While essentializing culture based on musical features clearly contradicts the very polyvocality and musical eclecticism under discussion here, the rhetoric of the worship wars indirectly references Sachs’ ideas in interesting ways. Considering his logogenic/pathogenic dichotomy provides a label for some of their concerns. Sociologist Mark Chaves (2004) suggests a dichotomy with poles similar to, and yet subtly distinct from, those of Benedict’s Apollonian-Dionysian and Sachs’ logogenic-pathogenic. Chaves’ dichotomy, however, uses the slightly more neutral terms of intellectual versus emotional. In his 2004 work Congregations in America Chaves analyzed the changing institutional and expressive behavior of American congregations. His analysis identified various expressive elements of worship on a continuum between intellectual and emotional behavior. While all of the congregations in his study exhibited a mix of these elements, he found strong correlations between denomination, expressive behavior, and cultural context (such as levels of income or education). In Chaves’ model, intellectual worship features more liturgical elements and fixed forms, whereas emotional worship uses more movement and spontaneity. Chaves’ terms of ‘intellectual’ and ’emotional’ carry different connotations than do those of Benedict and Sachs. They are more modern and accessible than either Sachs’ or Benedict’s labels. Chaves’ terms try to reference existing tensions while also staying clear of the loaded language of the worship wars. However, unlike Sachs, Chaves does not claim a causal relationship between musical style and other forms of expressive behavior. As referenced in the preceding discussion of Weber’s model, most mainline Protestants value their intellectual heritage. Like most mainline Protestants, Presbyterians fall towards the intellectual side of Chaves’ scale. Many of the emotional elements that Chaves identifies do not typify ‘traditional’ Presbyterian worship, but rather ‘emotional’ worship of other, often evangelical, denominations. Such a strong correlation between worship elements and congregational identity suggests musical changes would have significant broader impacts. Within the context of modern mainline Protestantism, the ‘contemporary’/‘traditional’ duality rearticulates many of the dynamics captured by the above oppositions. ‘Contemporary’ music is dismissed by its critics as valuing repetition, emotionality, excitement without theological depth. ‘Traditional’ music is similarly derided as overly intellectual, irrelevant to everyday life, and with too much emphasis on form over content. In negative terms, the ‘contemporary’/‘traditional’ debate could be (and has been) summed up as entertaining, enthusiastic celebration versus boring, cerebral ceremony. The above-discussed dichotomies often applied to religious music tend to set up an opposition between expressive behavior and reserved behavior. As models, these binaries are helpful in understanding the dynamics of the ‘contemporary’/‘traditional’ dichotomy. They demonstrate how pervasive diametric thinking is, and how we have historically used it to order our world. However, these oppositions do not explain why or how a single congregation would support multiple styles of worship. If anything, the oppositions demonstrate how such stylistic overlap or co-existence would compromise the identifying characteristics of the group’s ritual behavior. If one social location yields one set of worship practices that communicates a particular theology (Chaves: 2004:140), then how can increasing numbers of mainline churches accommodate multiple worship styles within single congregations? Often, with great tension and conflict. 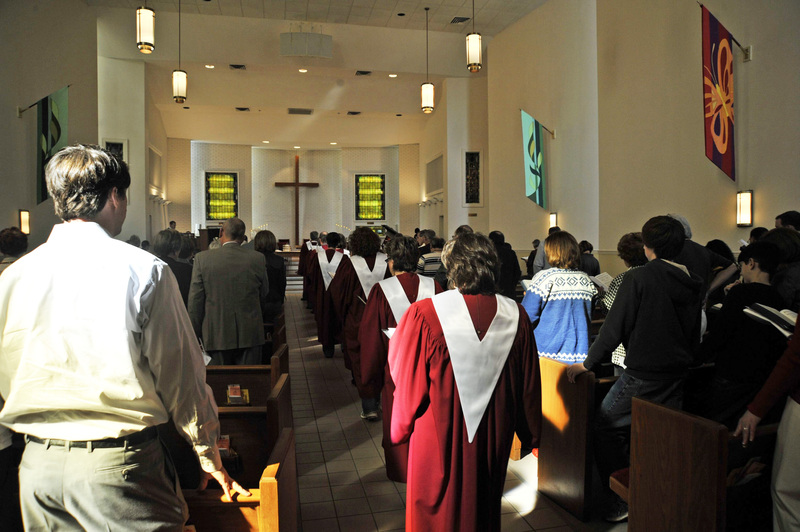 Mainline churches add ‘contemporary’ services to hold more public appeal, but contrasting musical styles frequently become incendiary points of contention within these churches. In many cases, musicians or ministers relocate, congregations split, and communities are compromised. Surface level oppositions over concrete worship elements symbolically manifest deeper undercurrents of conflict. The argument may ostensibly be guitars versus organs, but at the base, the debate addresses the appropriate human relationship to the divine. Each dichotomy that we have explored illuminates a particular angle of the ‘contemporary’/‘traditional’ debate. I therefore suggest apply yet another analytical dyad to shine further light on the subject: public/private. The public/private dichotomy offers a model that extends Weber’s concerns of institutional control while incorporating Benedict’s, Sachs’, and Chaves’ focus on restraint and release. Applied during various periods of history, these above-discussed dyads address various aspects of religious practice, while dealing with issues of agency and authority indirectly or primarily in terms of institutions. The public/private opposition asks who has control, and how much control, over action on both individual and institutional levels. ‘Traditional’ worship has supported particular balances of public and private action, the ‘contemporary’ approach inverts many of these relationships. Ensembles become individuals; parts are unified; instrumentation diversifies; group leadership is centralized; denominational connections diminish. Worshippers try to make sense of these changes by creating categories and oppositions, frequently drawing from the academic theories previously discussed. In the following sections, I apply the public/private dichotomy to one Presbyterian, PC(USA), church’s ‘contemporary’ and ‘traditional’ services to demonstrate how this analytical paradigm further illuminates the reconfiguring values embodied in the music of modern American Christian practice. The public/private dichotomy offers multiple options, depending on the definition of public and private being used. Rather than claiming fixed definitions in this analytical exercise, I consciously employ the fluid, mutable categories that worshippers themselves use. Although this methodology does not yield the tidy conclusions of a strictly defined dichotomy, it gives us a better picture of how worshippers reconcile the emergent, subjective contradictions they experience in everyday religious practice. Having established the framing context for Hillsboro Presbyterian Church in Nashville, Tennessee, the rest of this paper explores this church’s contrasting worship styles through the lens of public and private agency. Longer than any current members can personally recall, Hillsboro Presbyterian Church has held a worship service at 11 o’clock on Sunday mornings. This service has always featured congregational hymn singing, organ music, choral singing, and often piano. In 1995, the church began offering an early service at 8:30 on Sunday mornings in addition to the 11 o’clock service. The new service was supposed to balance private and public appeal, reaching out to both current members and also responding to ‘contemporary’ praise and worship services being offered by neighboring churches. The early service was to retain elements of Presbyterian worship, but it was also intentionally designed to provide a contrast to the music and worship style of the later service. Within months, Hillsboro’s terms of “early service” and “late service” were synonymously glossed with ‘contemporary’ service and ‘traditional’ service. Shortly before the 11 o’clock service at Hillsboro, congregants chat over the coffee machine, children scamper through the hallways, and robed choir members assemble in the narthex. The bell in the steeple tolls to summon the people to the sanctuary. After an organ prelude and pastoral welcome, organist Tim Gmeiner sounds the opening chords of the first hymn. The ministers and congregants consult their bulletins to find the hymn number, open their hymnals to #455, and stand to sing. This week, senior pastor David Kidd has chosen to open the service with All Creatures of Our God and King. The lyrics are attributed to St. Francis of Assisi in 1225, while the music is an arrangement of the 1625 Geistliche Kirchengesang’s melody Lasst Uns Erfreuen. Processing in a single-file line from the back of the sanctuary to the choir loft beyond the altar, the choir members lead by singing parts as they walk down the center aisle of the congregation. While most congregants sing the melody, only a few follow the choir by using the printed music to sing an alto, tenor, or bass harmonic line. The hymn’s collective lyrics – our, us, we – speak of communal praise, theologically positioning humanity as one part of a created world. Taken in their entirety, the six verses of the hymn begin by connecting humanity with God’s creation and end with an exposition of Trinitarian theology. All Creatures explicitly references God, honoring the divine as male and regal. 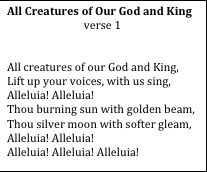 The lyrics combine theological exposition and praise, through the repeated Alleluias. Upon the conclusion of the hymn, the choir remains standing in rows in the choir loft, facing the congregation. Following a signal from the director, they sit in unison and the rest of the worshippers follow their example. Hymnals are replaced in the pew racks, bulletins rustle, and the service continues. For most of the 20th century, this ‘traditional’ music has been Presbyterian worship music. But now rewind a few hours earlier on this Hillsboro Sunday morning. As the song begins, a large screen is lowered from the ceiling and congregants raise their eyes to the projected lyrics. Mouthing 2-3-4, Nix counts the praise band in to the opening song, Breathe. Although Nix and the band vocalists sing in carefully scripted harmony, the congregants sing in unison. As the closing line of the song fades away, the drummer brushes tinkling chimes. Just as he opened the time of singing with a spoken introduction, Nix now says quietly into his vocal microphone, “You may be seated.” Congregants and band members sit, the projected lyrics fade back to an inspirational picture, and the service continues. The language of Breathe emphasizes personal rather than public, or corporate, spirituality. Lasting for two four-beat measures each time it is sung, “I” is the most emphasized word in the song. Overall, the lyrics speak of a highly personal, intimate relationship between the singer and a sustaining God. Yet, reference to a Christian God as the object of the singer’s affection is implicit, rather than explicit. The musical climax of the chorus speaks of longing and desperation but, in contrast to the explicit theology of the traditional service’s hymn, allows the exact object of the singer’s desire to remain ambiguous. 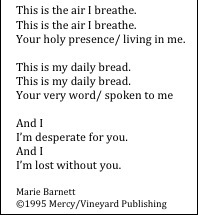 Nonetheless, for participants familiar with Christian tradition, the song’s references to “daily bread,” “holy presence,” and the construct of bread as word clearly denote Christian theology. In comparison with only each other, the contrasts between these two services can be made to demonstrate an emotional-intellectual, Dionysian-Apollonian, logogenic-pathogenic, or even charismatic-routinized opposition. The ‘contemporary’ service music uses fewer words, more emotion, popular instruments, and positions the quasi-defined “you” as the object of charismatic appeal. The ‘traditional’ service song has a dense text, focuses on intellectual understanding, and is led by ceremonially robed musical specialists. Particularly for religious participants who are familiar with either tradition, the contrasts between these two styles can seem apparent and plentiful. However, these dichotomies purposefully seek contrast to the exclusion of similarity. In the broader context of cross-cultural, cross-confessional worship forms and styles, these opening Sunday morning singings are remarkably similar. Congregants gather in a worship space during a musical prelude, they sit quietly in rows of seats, and a minster greets them. They stand to sing, read the lyrics, make very little (if any) motion while singing, and return to their seats. Given the vast variety of forms that worship can take – from ecstatic dance and spirit possession to meditation and chant – the contrasts between Hillsboro’s early and late services seem relatively minor but, as the broader fervor over ‘contemporary’ and ‘traditional’ music evidences, there are real differences here. The public/private dichotomy provides a useful tool for exploring them. One of the main differences between Hillsboro’s ‘contemporary’ and ‘traditional’ services lies in musical agency. Who selects music? Who performs music? Authority in ‘traditional’ service music supports a greater degree of public agency, that is, distributed authority. This system purposefully reflects Presbyterian governance and theology by reinforcing denominational and pastoral authority, while also delegating responsibility to multiple qualified individuals. Presbyterian tradition dictates that since hymn lyrics are sung theology, the important task of hymn selection is the responsibility of whichever minister is preaching on a given Sunday (usually the senior pastor). At Hillsboro, with very few exceptions, Senior Pastor David Kidd selects hymns from the Presbyterian Hymnal. Printed by Presbyterian headquarters in Louisville, Kentucky, this denominational resource has been designed to provide congregations with “singable” selections that communicate Reformed theology. Other musical pieces, which ideally function to support the sermon, are selected by musical staff. Organist Tim Gmeiner selects the instrumental pieces: the prelude, offertory, and postlude. Music director Sherry Kelly chooses and directs the choral anthem. In contrast, musical selection in the ‘contemporary’ service is privately held by one individual: the band leader, Stephen Nix. Nix selects or writes all of the service music himself, pulling repertoire from sources as diverse as popular radio hits and local Nashville, Tennessee, to recording artists to old hymns and personal compositions. Instead of the traditional Presbyterian bureaucratic structure of committees and delegated authority, Nix privately holds musical agency. This public/private agency contrast holds a number of implications, one of which involves the perception of spontaneity. In the ‘contemporary’ service, private agency leads to greater opportunity for spontaneity. For the most part, the selections in both the ‘traditional’ and ‘contemporary’ service are pre-determined, although Nix occasionally makes changes to the order or the content during the ‘contemporary’ service. The song titles, tune names, composers, and page numbers are laid out in the ‘traditional’ bulletin. This information is, however, purposefully absent from the ‘contemporary’ service’s printed bulletin, although the element of the service – for example, Chorus of Gathering and Adoration, Song, or Anthem – is listed. This appearance of spontaneity, coupled with occasional actual unrehearsed events, touches many worshippers. Most Hillsboro congregants are quick to praise Nix’s musicianship and spirituality. They feel that his ability to build atmosphere through music and spontaneously respond to the sermon through an appropriate selection demonstrates the immanent presence of God in the service. This subjective perception of God’s presence rests upon spontaneity, which in turn rests upon private agency over the music in the ‘contemporary’ service. Yet, if the lines of contemporary/traditional, public/private musical control suddenly seem clear, consider that this definition of public and private agency has focused only on the number of people in authority. Let us muddy the waters and consider an expanded definition addressing the not only the number of people in authority but also the characteristics and bases of legitimacy of the people with agency. This multivalent perspective engages different criteria of public and private. As a result, selection of congregational song could be considered more private in the ‘traditional’ service and more public in the ‘contemporary’ service. This sense of public/private can be seen to manifest in two ways. First, the ‘traditional’ service can be seen as more private based on the repertoire used for congregational song. The body of potential congregational song available to the ‘traditional’ service at Hillsboro comes from a resource specifically developed for 2.3 million members of the Presbyterian Church (USA): the denominational hymnal. Senior Pastor David Kidd draws Hillsboro’s ‘traditional’ congregational vocal selections from this 500-song hymnal. The hymnal’s repertoire is not completely exclusive to the Presbyterian Church, but its selections have been compiled with an internal focus on strengthening particular theology within this particular group. Presbyterian churches are free to use other resources beyond the denominational hymnal for congregational song, but choosing to do so puts congregations in a difficult position. As previously mentioned, in the Presbyterian Church, the pastor preaching on a given Sunday has the responsibility to select the hymns. Presbyterian seminary training does not, however, necessarily include hymn selection. With the historical and theological centrality of the sermon in Reformed churches, the text of the hymns has been ideologically seen as their primary point of value. Describing himself as “unable to carry a tune in a bucket,” Hillsboro’s senior pastor David Kidd has no formal musical training. The combination of Kidd’s responsibility to selection congregational hymns coupled with his lack of musical background leads Kidd to draw upon the Presbyterian hymnal. Kidd selects music from the denominational hymnal for two main reasons: 1) the selections are theologically sound, and 2), the selections have already been deemed “good” by professional musicians. Thus, by selecting from among a fixed body of music, congregational song can be seen as accenting the private. In contrast, musical agency in the ‘contemporary’ services draws from a more public body of music. Without relying on hymns, the ‘contemporary’ service moves away from the pastor selecting hymns from the hymnal to the band leader choosing from a much wider range of repertoire. Conversely to Pastor Kidd, band leader Stephen Nix has no formal divinity training, but rather a public, hands-on theological education. He has earned degrees in music, toured as a professional musician, coached vocalists and composers, and worked in church music at varying levels. Because of his strong background in performance and production, Nix has the ability to tailor vast musical resources specifically for Hillsboro’s seventy-five or so early service congregants. He pulls resources from a wide variety of sources: other churches, Christian Contemporary Music on the radio, his own compositions, gospel hymns, secular hits, and more. Thus, whereas Hillsboro’s ‘traditional’ service draws upon a relatively private resource, the ‘contemporary’ service draws upon equally public sources to create music for its repertoire. The preceding analyses offer contrasting approaches to public and private that intersect with our list of religious dichotomies. Public versus private is variously defined as delegated versus sole authority, unlimited versus limited repertoire, life-experience versus scholarly qualification. We can see elements of Weber, Chaves, and their theoretical colleagues in these dichotomies. Hillsboro congregants employ these various points of view as they mediate their Sunday morning musical experiences. Music plays a significant role in their understanding God as immanent or transcendent, and Presbyterian worship as fulfilling or lacking. In this following section, I play Devil’s Advocate to alternate between analysis of public and private aspects of congregational song at Hillsboro Presbyterian. To begin, are the musical ensembles private or public? In both services, private ensembles lead the worshipping public. 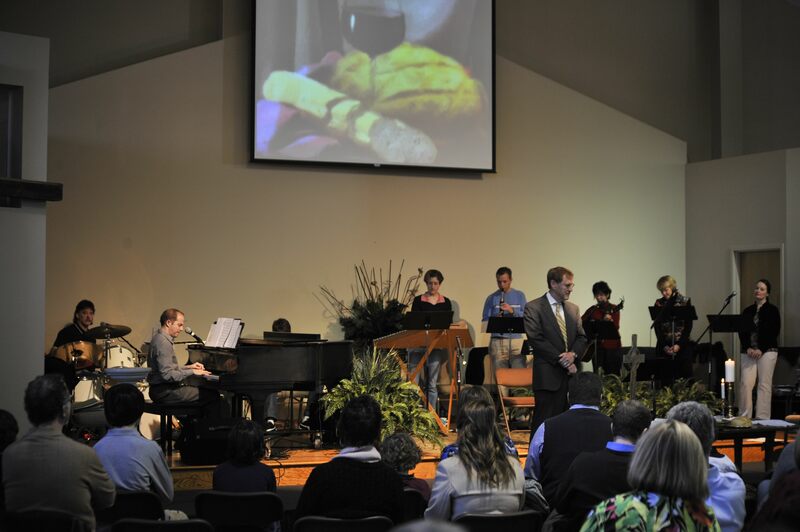 In the contemporary service, a praise band uses popular (read: more public) instruments which include (at least) piano, guitar, and drums, as well as vocals. The instrumentation, lyrics, and musical style aim for resonance with mainstream secular culture. Yet, private agency is encouraged. Each singer or instrumentalist renders a unique musical part. Band director Nix often exhorts the singers to “own the song! Put more of yourself into it!” The band members choose what they wear, generally varying outfits each Sunday. Through their individualized dress and musical choices, members bring aspects of their private identities into the public sphere. In contrast, the ‘traditional’ choir de-emphasizes individuality and private identity. Flowing robes keep personal dress a private matter. Director Sherry Kelly’s classical musical aesthetic does not encourage vocal individuality or deviation from the written score. Choir members are instructed not to draw attention to themselves as individuals through movements, facial expressions, or vocal style, but rather to consider the group as a public unit. Yet, in contrast to the praise band, the choir advertises itself as always open to new participants. Director Kelly often approaches congregants to sing with the choir and tries to recruit new members. Because of the size of the group and the aesthetic of a blended sound, less confident singers (who self-describe as not talented enough to sing in the praise band) are willing to participate and sing in public. Secondly, are the modes of musical transmission more private or public? Congregants in the ‘contemporary’ service read the songs’ texts (without musical notation) from a projection screen in the front of the room. Worshippers lift their heads together to see the words and collectively stumble if the projection falters. Without musical notation, the people sing in unison as they “directionally hear” the melody’s ups and downs (Nix 2008). Many congregants who regularly attend this service report feeling more comfortable with their aural musical literacy within this services’ familiar genres, such as country, light jazz, gospel. The use of popular genres embodies mainline perception that they should reach out to the unchurched public through non-traditional church music. In imitation of worshippers at Hillsboro Presbyterian, these analytical sketches vacillate in their definitions of public and private. Sometimes public emphasizes participation, others self expression. Private means that individuality is expressed, or the very expression of individuality may conversely render it public. While, on one hand, the subjectively-defined terms as public and private might seem too fluid to form the basis of an analytical model, on the other hand, this flexibility echoes the polyvocal bricolage of interpretation that I found both in single worshippers and the Hillsboro congregation as a whole. Similar to other dichotomies, the public/private opposition provides a better research tool than a conclusion for the ‘contemporary’/’traditional’ debate in mainline Protestantism. Neither style is more objectively publicly or privately focused than the other. In fact, single points of ‘contemporary’/‘traditional’ comparison can often be interpreted as contrastingly emphasizing public or private elements. For example, diversified praise band instrumentation encourages each player’s privatization, but the resultant sounds hold wider public familiarity. The choir’s robes create a public statement of homogenous unity, but also set the group apart as exclusive and private. The same aspects of worship and music can be taken as variously public or private, depending the analyst. I purposefully say that the music can be rather than is because the public/private binary emphasizes subjectivity in the intense controversy of the worship wars. Most of the mainline Christians under discussion have been culturally conditioned to manage baffling confusion through both through binary comparison and tolerant pluralism. Reflecting society at large and middle-of-the-road mainline ideology, worshippers often want to state their identity by picking a side, but without invalidating others’ preferences. Much of this analysis is subconscious, and worshippers often find themselves at a loss for words when pressed to explain their initial responses. However, as the phenomenologists would remind us, experience is subjective and emergent. Participants decide which analytical dichotomies they want as lenses to filter their experiences, and as my research demonstrates, they often do not restrain themselves to a single theoretical framework. If a single congregation approaches both ‘contemporary’ and ‘traditional’ music as music with public appeal, then (at least for them) it can be. If they choose to emphasize both worship musics as private, then they can be so. The public/private dichotomy helps move past resulting surface level arguments (praise choruses vs. hymns, organs vs. guitars) to take on fundamental questions: How does musical change affect other kinds of changes in sacred and social structure and experience? Some oppositions explain how the worship wars came to a rolling boil, the subjectivity and the public/private dichotomy reveals the contrasting tensions that keep the fires of conflict at a low simmer. Benedict, Ruth. 2005. Patterns of Culture. New York: Houghton Mifflin Harcourt. Chaves, Mark. 2004. Congregations in America. Cambridge: Harvard University Press. Greenwell, Megan. March 2, 2009. “Blogs In, Badges Out as Girl Scouts Modernize.” The Washington Post. Grossman, Cathy Lynn. March 9, 2009. “Most religious groups in USA have lost ground, survey finds.” USA Today. Kelley, Sherry. March 12, 2008. Personal Communication. Kidd, David and Nancy McCurley. March 8, 2008. Personal Communication. Lindsay, Sue. March 17, 2009. “Justice Thomas: Americans Don’t Sacrifice as Much.” Associated Press. Loveland, Anne C. and Otis B. Wheeler. 2003. From Meetinghouse to Megachurch: A Material and Cultural History. St. Louis: University of Missouri Press. Marcum, Jack. 2008. http://www.pcusa.org/research/gofigure/oct08. (Accessed April 19, 2010). Merriam, Alan P. 1964. The Anthropology of Music. Chicago: Northwestern University Press. Nix, Stephen. June 5, 2008. Personal Communication. Presbyterian Church (USA). http://www.pcusa.org/navigation/whoweare.htm (Accessed April 19, 2010). routinized. (2010). Merriam-Webster Online Dictionary, http://www.merriam-webster.com/dictionary/routinized (Accessed April 19, 2010). Sachs, Curt and Bessie Schönberg. 1937. World History of the Dance. New York: Norton. Weber, Max. 1993. The Sociology of Religion. New York: Beacon Press. i When referring to genres of worship music, I use quotation marks for ‘contemporary’ and “traditional.” As labels, these terms have taken on specialized meaning apart from common usage. To prevent confusion, I have avoided using the words as general adjectives. Nonetheless, the quotation marks further clarify these words as denoting particular genres. ii “Mainline” is an informally assigned adjective denoting the theological moderation and former social prominence of many Protestant denominations. The term is generally understood to include (at least) American Baptists, Disciples of Christ, Congregationalists /United Church of Christ, Episcopalians, Lutherans, Methodists, and Presbyterians. iii Nonetheless, most mainline churches continue their denominations’ historical demographics of maintaining about a 95% White membership. iv While the worship wars have affected most branches of Christianity in North America and Western Europe, mainline Protestants have been among the most strongly impacted by this controversy. Historically, mainline Protestants have been more resistant to the incorporation of secular musical styles than Evangelical groups. The Catholic Church experienced a parallel discussion on worship music following Vatican II (1962-1965). v These dynamics and social trends are reflected throughout nearly every denomination of Western Christianity, however full treatment of this topic lies beyond the scope of this paper. writing her dissertation for Indiana University while living in Wuerzburg, Germany. Next Stephen Benson, ed. Contemporary Fiction and the Fairy Tale. Religion is a really important part of our lives. Without it, we will have no direction. Songs such as these remind us how we are one in religion. I love, love, love wrshoip music. It speaks right to the heart of me. Have you listened to GoFish with your kids? They are enjoyable for adults and kids alike. Great harmonies, great message.